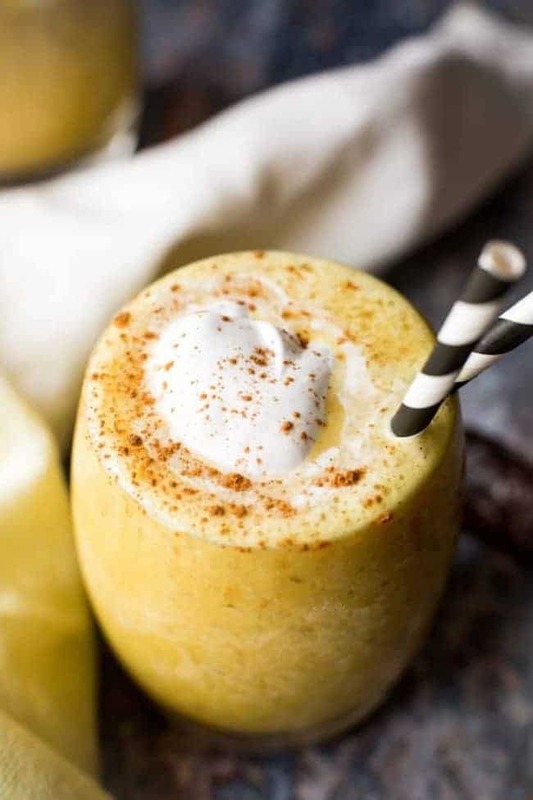 Quick note for anyone coming from Pinterest: When I was making the pinterest graphic to go along with this post I completely blanked and listed this as being a FODMAP friendly drink. 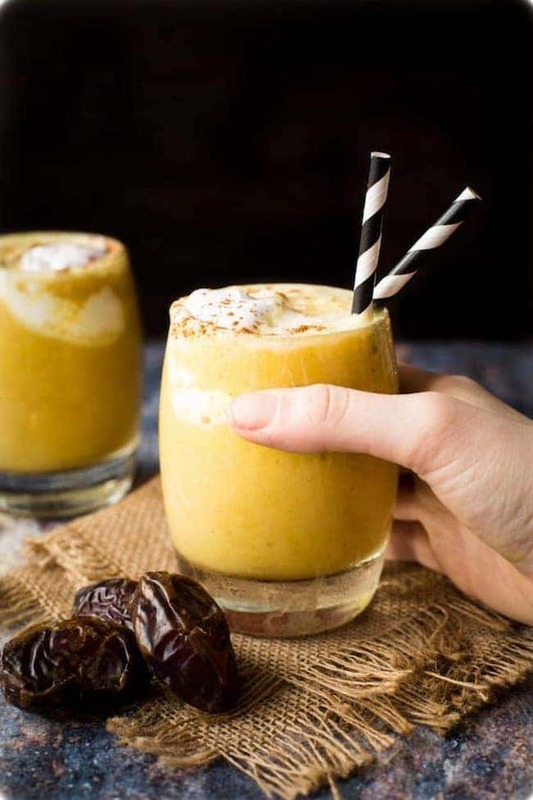 Dates are certainly not low FODMAP and coconut milk can be trouble too so this isn’t suitable for anyone needing to follow a low FOMDAP diet. I’ve updated the pinterest graphic to remove the low FODMAP wording, but I can’t do anything about the one that’s circulating around Pinterest. Very sorry about that! If you would like to make this more FODMAP friendly you can replace the coconut milk with one of your choosing and use 1-2 tablespoons maple syrup to sweeten your drink. Move over Unicorn Frappuccino – there’s a new non caffeinated frappe in town. Now that the summer is slowly creeping in my M.O. is basically to eat and drink all the frozen things from now until when the pumpkin spice lattes start rolling in. We’ve got a very short window of opportunity for sun here in our little part of the would so I’ve got to make sure I fit it all in when I can. Starting with this sweet, light, creamy, frothy perfection that is the golden milk frappuccino. Join me! All you need is about 5 minutes & a decent blender to make this frappe. Since there’s no coffee you don’t need to wait for anything to brew or cool down. Just blend together until the dates and turmeric are fully blended and then add in the ice. Once you’ve reach your desired consistency top it off with a little dollop of coconut whip cream and a dash of cinnamon. Enjoy this in the morning on a hot day or end your night with a little frosty indulgence. Since there’s no caffeine found here you don’t need to worry about bouncing off the walls all through the night. And hey! If it’s too cold for this you could always make a hot version instead. No matter what it’s a win! Don’t forget to #asaucykitchen on instagram if you try this Golden Milk Frappuccino! We love seeing what you make! You can also post your pictures to my facebook page! 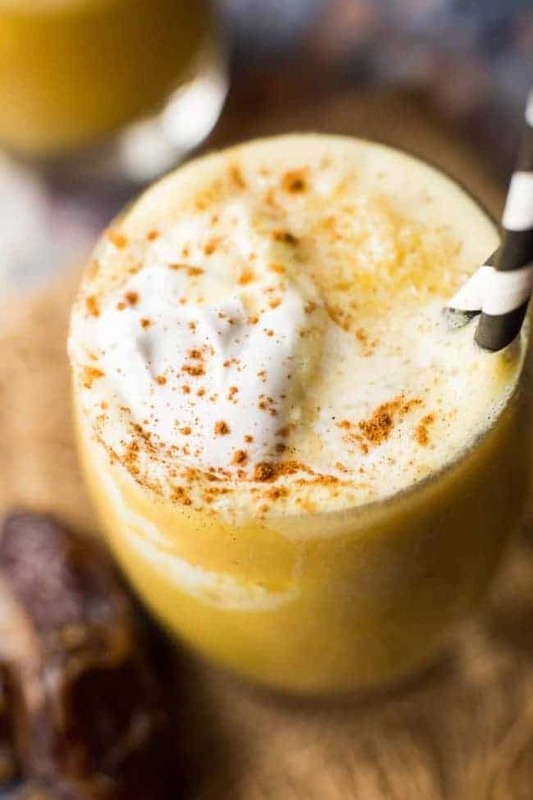 Add the dates, turmeric, coconut milk, cinnamon, and black pepper to a blender and blend on a high speed until the dates and the turmeric are fully blended. Add the ice to the blender and blend until icy & smooth. Top with coconut whipped cream and cinnamon and enjoy! Quick note for anyone coming from Pinterest: When I was making the pinterest graphic to go along with this post I completely blanked and listed this as being a FODMAP friendly drink. Dates are certainly not low FODMAP and coconut milk can be trouble too so this isn't suitable for anyone needing to follow a low FOMDAP diet. I've updated the pinterest graphic to remove the low FODMAP wording, but I can't do anything about the one that's circulating around Pinterest. Very sorry about that! If you would like to make this more FODMAP friendly you can replace the coconut milk with one of your choosing and use 1-2 tablespoons maple syrup to sweeten your drink. Just tried this drink and it was perfectly delicious on a hot day! I used powdered tumeric as I didn’t have any fresh stuff and it still worked great! So glad you liked it! Thanks Brea! I’ve made this several times, it’s so good! I came across it when I was looking for an anti inflammatory smoothie for when I’m pms-big or on my period. I do modify it a bit here & there. I don’t really like dates in my smoothies, so I used half a frozen banana & it gives it creaminess & sweetness, it’s really good! I also used fresh ginger along with the fresh turmeric. Cardamom or nutmeg is a good addition as well. Thank you for this great recipe! Do you have an idea of how much honey I could use instead of f dates? this was really yummy! thanks for the recipe! Can you use powder turmeric have a very good one. Yes! you can use 1 teaspoon ground turmeric. The only thing to keep in mind is that too many ground spices in drinks can sometimes sink to the bottom which some people may find a little unpleasant when you get to that last sip. Amazing! Loved it! And I only used one date – plenty sweet enough for me! Made this last Saturday morning, my new morning drink, ty. Oh, this sounds LOVELY! I have everything to make it too and am fighting a nasty bug. I think this is calling to me right now! Thanks Kristen! I hope you feel better soon!